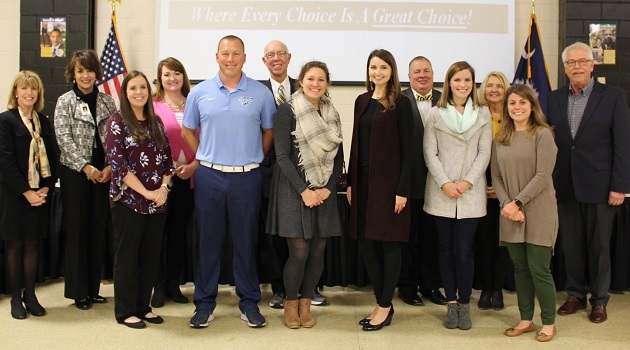 An additional nine Lexington-Richland School District Five teachers have earned the prestigious National Board Certification this year, and 28 teachers in School District Five renewed their national certifications for a second 10-year certification period. School District Five ranks among the top for National Board Certified Teachers (NBCTs) in the state, now touting 306 educators with this prestigious designation. National Board certification is a voluntary, advanced teaching credential that includes an extensive series of performance-based assessments. Educators pursuing the certification must undergo a rigorous process that includes teaching portfolios, student work samples, videotapes and thorough analyses of the candidates’ classroom teaching and student learning. Teachers must also complete written exercises to gauge the depth of their subject-matter knowledge, as well as their effectiveness in teaching those subjects to their students. District Five teachers becoming National Board-certified this year include: Jessica Alderman (Chapin High), Lauren Brown (Spring Hill High), Diana Batson (Irmo Middle), Carianne Chapman (Irmo Elementary), Whitney Christley (Irmo Elementary), Joanna Connell (CrossRoads Intermediate), Jasmine Green (Leaphart Elementary), Jason Jolley (Chapin Middle), and Jennifer Long (Nursery Road Elementary). District Five Teachers renewing their certification this year include: Dione Bell (Chapin Intermediate), Chad Boland (Spring Hill High), Sarah Bowers (Chapin High), Ashley Davis (Irmo High), Matthew Gams (River Springs Elementary), William Green (Irmo Middle), Lindsay Head (Oak Pointe Elementary), Nicole Herring (Chapin Intermediate), Taryn Hixenbaugh (Harbison West Elementary), Sara Kimberlin (Chapin High), Louis Landreneau (Dutch Fork High), Barry Lee (Irmo Middle), Martha Leonard (Seven Oaks Elementary), Elizabeth Magee (Special Services), Katie Manning (Chapin Middle), Paula Matthews (Leaphart Elementary), Angela Morvay (Irmo Elementary), Diane Padula (Irmo High), Liesl Price (Irmo Elementary), Antrichia Ross-El (Harbison West Elementary), Sara Semple (Seven Oaks Elementary), Patrick Smallwood (Center for Advanced Technical Studies), Kelly Still (Chapin Elementary), Elizabeth Thompson (Ballentine Elementary), Carl Tilson (Dutch Fork High), Susan Vaughn (CrossRoads Intermediate), Liz Wertz (Chapin Elementary), and Monica Williams (Irmo High).